PHILADELPHIA — December 19, 2016 — It’s hard to believe that our annual Printing Impressions 400 marks the 33rd consecutive year we’ve been compiling this list of the top printers in the U.S. and Canada ranked by annual sales. Frankly, it’s a labor of love that requires year-round additions and subtractions to our database, as well as seemingly endless follow-up phone calls and emails to track down nonresponders. It’s well worth it, though; I continue to be amazed how far-reaching this list is — not just for analysis by industry vendors, printers, print buyers and marketers/brand managers, but also within the analyst and private equity communities. In fact, the PI 400 remains the most downloaded entity year-round on our PIworld.com website. This year’s ranking reflects a major shakeup within the top 10 companies shown, largely as the result of the October 2016 breakup of RR Donnelley into three separate, publicly held entities. Since none had completed a full year as standalone companies, we had to publish their announced run rates. Still, it’s interesting to note how M&A activity among our industry’s publicly held conglomerates has waned, resulting in flat sales growth. The outlier was Cimpress (Vistaprint), which consummated deals to expand internationally. Perhaps the days of the industry mega-mergers have passed. The core of the 2016 Printing Impressions 400 remains privately held — many of them family owned — establishments. Companies that have grown the most organically, in large part, have targeted specialties like packaging, direct mail and wide-format digital printing. And M&A activity, including tuck-ins to acquire account bases, remains a leading avenue for midsize companies to increase and sometimes just maintain their revenues. The vast majority of these core businesses on the PI 400 have also built strong digital printing footprints. Offset-only, midsize general commercial print shops are now largely extinct. From a technology standpoint, the advent of production inkjet printing continues to breathe new life to market segments such as books, direct mail and transactional printing. High-speed inkjet is also starting to pervade into the publication and catalog printing markets. And the growing range of cut-sheet inkjet presses now available is proving to be well-suited for general commercial work. Likewise, wide-format inkjet printing continues to blossom, as does the emergence of digital enhancement presses that enable special effects and finishing techniques. Due to these and other digital advancements, there truly does seem to be a renewed sense of excitement surrounding the future of the printing industry, as exemplified by the Top 400 companies — and the detailed information we include about them — that appear on our venerable list. Check out where you stack up against your competitors. 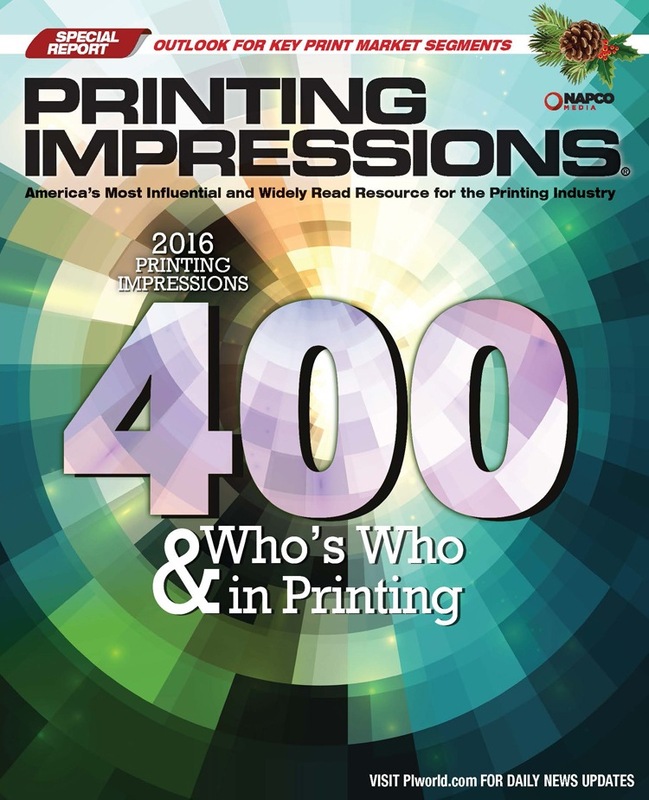 Click here for the 2016 Printing Impressions 400 ranking (Opens as a PDF).